Did Antonin Dvořák ever surpass what he accomplished in his Piano Quintet No. 2? A magnificent synthesis of form, folk, and feeling sustains through four movements that constitute some of the late 19th century’s most brilliant chamber music. 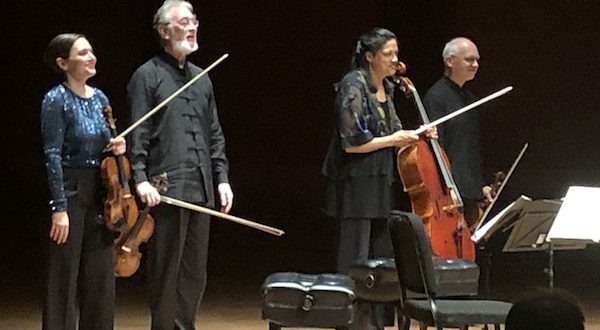 Pianist Marc-André Hamelin joined the Juilliard String Quartet on Friday night for a fluid, sensitive and just plain exciting account of this monumental work. It followed admirable performances of music by Haydn and György Kurtág from the Juilliard. The extreme contrasts of the Dvořák’s first movement demand collective adjustment of coloration as well as dynamics. A master of exquisite tone as a soloist, Hamelin employed a delicate touch to create a sound that slid smoothly into the textures of the strings while maintaining clarity and his characteristically beautiful tone. With prominent piano passages, the slow dances of the second movement call for extra-fine balance. Dvořák titled this movement a “Dumka” to suggest folk music with, as the program notes put it, “wild mood swings.” It was the delicious thematic variety, though, and the agile major-minor shifts that stood out in this performance. In the lively folk-dance themes of the third movement the piano sounded like bells against the warm strings, while the slow section sounded truly ethereal. The first movement’s passionate romance returned in the finale’s contrasts, reminding us of the composer’s debt to Brahms. But Hamelin and the JSQ’s happy collaboration conveyed a powerful overall message of a composer of enormous originality at the height of his powers. New first violinist Areta Zhulla has brought fresh dynamic energy to the JSQ and at the same time, by this point, firmly fused her style and sensibility with those of the other three players. Before the intermission, the Quartet on its own gave a worthy rendition of Haydn’s String Quartet in D Major Op. 76 No. 5 along with Kurtág’s interesting Six Moments Musicaux Op. 44. Pairing classical works with modern ones is a rewarding exercise for the audience as well as a challenge for the musicians. It reveals additional dimensions of the ensemble’s sensibility, and it introduces us to new music and unfamiliar composers. The Haydn’s first movement was appropriately fiery, with plangent singing tones. The wonderful “Largo” glowed with swaying harmonies, the musicians plumbing the depths of emotion in the dark lower-register passages and bringing out the dynamics with exquisite sensitivity. They went on to find deeper meanings than I knew in the “Menuet,” riding especially on the cello’s warm and emotive bass line melodies. They finished by negotiating the scampering tempo of the finale with marvelous synchrony. Kurtág’s Moments Musicaux begins with staccato attacks and hushed, eerie drones. The halting rhythms carry through most of these six short pieces. In the second, hints of melody surface amid gruff assertions and tense dissonances. The nervous twittering and cascading intervals of the third set up the legato ruminations of the fourth, appropriately subtitled “étude pour les harmoniques.” Messiaen-ic bird calls and gracious dots of empty space suggest a pastoral scene in the penultimate piece – until the birds fly into a sonic funhouse mirror. Slow-burn angst returns in the final, Janáček-inspired moment. Altogether the JSQ made an excellent case for this mature work by a composer I had known only through his piano music. 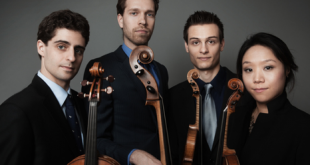 Their superb performance merged classical-minded studiousness with modernistic forcefulness and elasticity. They clearly showed their firm belief in this work and swept me into it too.